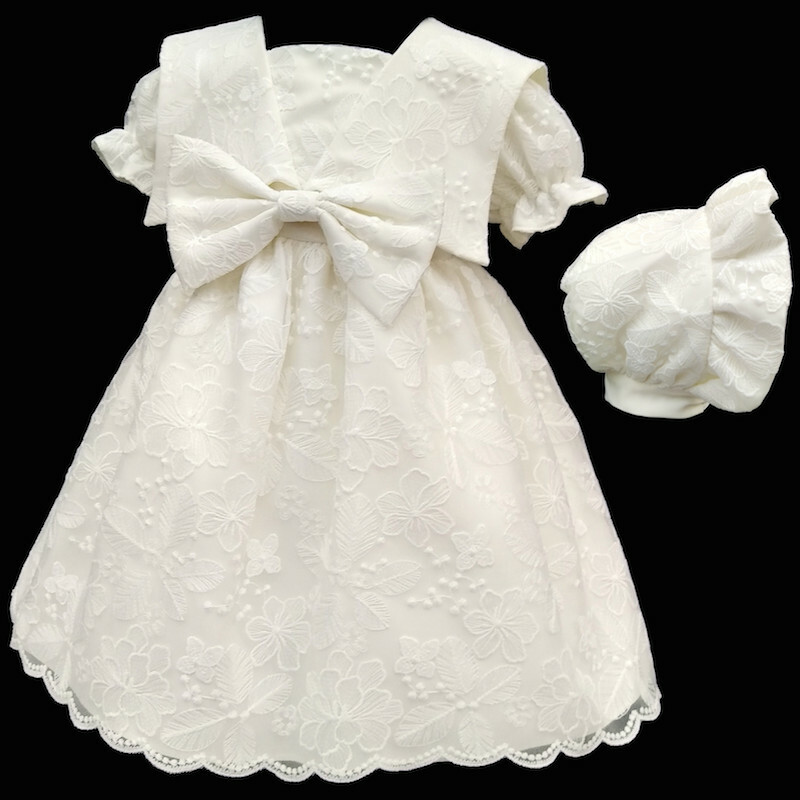 Baby girls ivory embroidered lace large bow dress & bonnet, the perfect christening dress for a baby girl but also suitable for all special occasions including wedding wear as a baby flower girl. Dress: Elegant ivory fully lined short sleeved dress with an overlay of all over embroidered lace. Deep sailor style collar with a large bow to the centre. An ivory satin ribbon which beautifully ties at the back with a button fastening. Fully lined with underlay netting to create fullness, with a frill to the hemline. 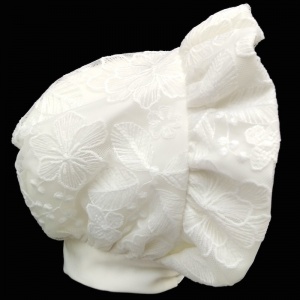 Bennet: Matching ivory bonnet with an all over embroidered lace design, with a frilly peak and satin ribbon tie, completing this elegant design. This baby girls dress & bonnet is made and designed with exceptional workmanship and quality material. Designed in England UK by the 'Visara'. 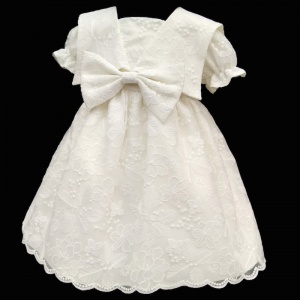 Now, this is a first for me but to all those mums out there trying to find their daughters a precious little outfit for their special day - this dress is simply beautiful and I could resist writing my first ever review!!! My angel looks adorable and I can't wait to show her off on her christening day. The material, attention to detail, pretty underlining make this dress outstanding quality and far better than I could have hoped for. I love top quality but refuse to pay the price tag and following the comments made by another reviewer I thought I'd take the plunge. I am not disappointed. So for anyone out there who is considering whether the take the risk and buy on line I would definitely say you will not be disappointed by the service, speed of delivery, outstanding quality and pretty design of this dress. Top marks Thank you for helping to make our day so special.